It’s been a while since the University of Colorado updated their satellite-based sea level data. But there’s a more recent update from AVISO. It looks like temperature isn’t the only thing that rose dramatically during 2015. The recent speed-up of sea level rise is notable, but it’s only been in place about a year, so it’s too early to tell whether this represents a genuine acceleration of the trend, or a temporary fluctuation. But it does represent a full centimeter of sea level rise we didn’t have before. We’ve already seen that coastal cities can be flooded from very high tides, without the need for storms or wind or rain — and every millimeter of sea level makes that more frequent and more severe. Which makes one wonder — which cost of global warming will emerge as the most costly? Will it be the flooding from torrential rainfall like we’ve seen in England? Wildfires such as hit Washington state last summer? Deadly heat waves like those that killed thousands in India and Pakistan last summer? Drought like that California hopes to recover from? Cyclones — like the two which bucked the odds and hit in January(!!! ), one in the Pacific and one in the Atlantic? Or will it simply be the slow creeping rise of the sea? Since 2005, the ENSO cycle seems to have amplified. Hopefully, it is not an artefact of the end of the Topex-Poseidon mission in January 2006. That makes the launch of Jason-3 on Sunday all the more important. I misread your comment, nevermind. I see the same exaggeration in the effect of el nino/la nina though. Somewhat lengthy but well worth the read. Scary stuff. Sea level at Miami is rising at the rate of one inch per YEAR. I’ve posed this on other blogs, but I suspect at least the initial part of the spike, which is pronounced, was caused by previously undetected thermal expansion in the far Western Pacific… as in, when that bulge of ocean water started sloshing back toward the Eastern Pacific, it suddenly came in contact with ARGO buoys. 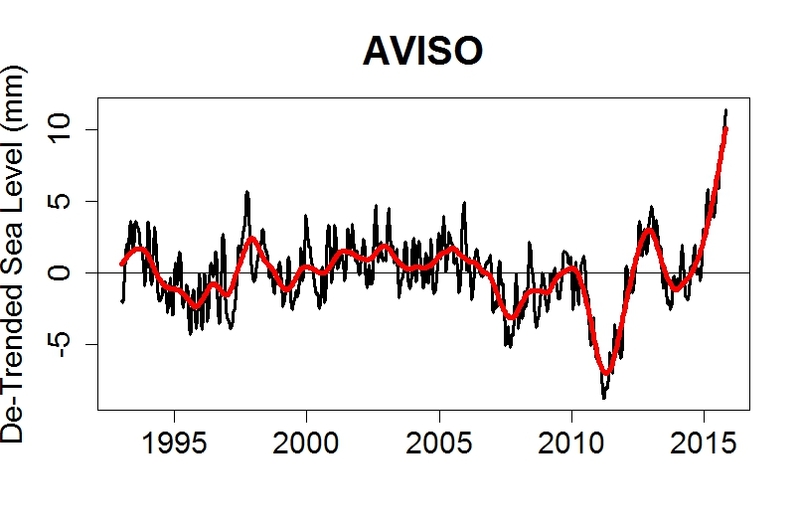 I’m probably wrong, but the way it pops up, before the EL Nino started, seems too aggressive to be just water warmed by ENSO neutral in early 2015. 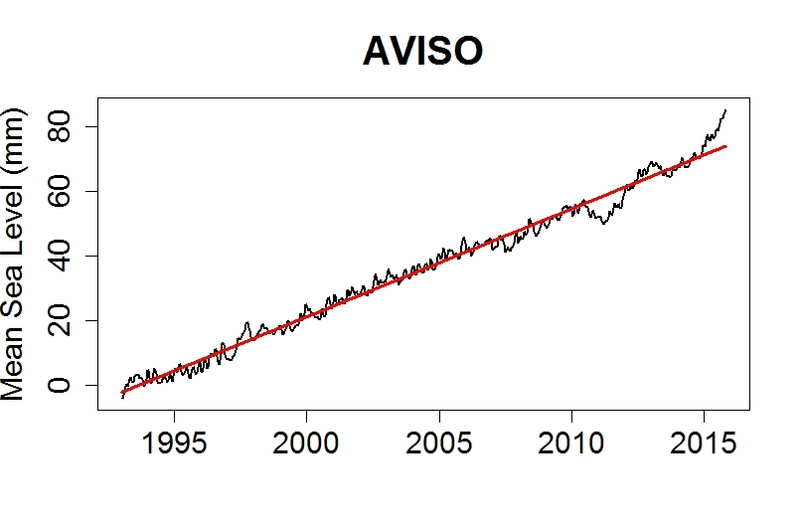 The other interesting graph on AVISO is the one that covers Jason 2: 4.24mm per year. 1. ARGO floats bob up and down, staying at the surface for only short periods. In other words, they measure mostly OCH, not SST. 2. The ARGO network is already worldwide and well dispersed, and has been for quite some time. In other words, there no place that any such blob could have escaped detection. The ARGO network is generally well-dispersed for open ocean measurements. However, as shown in this graphic, there is a coverage hole around Indonesia, along with some other notable areas. If you look at an altimeter trend map for the period between about 2004-2012 this region has around the largest rate of SLR in the world, yet is being missed by the ARGO network. Von Schuckmann et al. 2014 found that masking this region in gridded altimeter data results in a 20% drop in sea level trend over 2004-2011. Others have masked altimeter data by ARGO coverage globally and found a similar discrepancy, indicating that the ARGO network is geographically biased. Assuming half SLR rate is due to mass change, this suggests the ARGO network underestimated steric sea level rise contribution between 2004 and 2011 by about 40%. The Indonesian region is strongly linked with ENSO/Pacific variability. With the recent Pacific shift the bias is now pointing in the opposite direction since 2013. This coverage issue doesn’t affect the AVISO data though. Paul S. – one person suggested to me that the current spike is being caused by groundwater depletion… some sort of massive boost in irrigation activity to offset drought. Globally I can’t see that drought has been any more of an issue this year compared to last, or the year before that, so a groundwater depletion spike with this specific timing seems dubious. The sea level spike is pretty much in-line with expectations based on ENSO relationship. Thanks Paul S. … that looks convincing. Unlikely except as part of a long-term trend, partially offset by increased fresh water retained at the surface in artificial reservoirs. This trend might ultimately reverse as areas get a handle on groundwater management (much cheaper to manage your groundwater at a high storage level than a low one, assuming you have the political will to make that happen). Could be like aerosol pollution that started to reverse in the 1970s. I look forward to an article at WUWT by our friend C.R.Dickson (see https://tamino.wordpress.com/2016/01/13/hottest-year-on-record/ ) pointing out that if graphs of global sea level against time were constructed with the Y-axis starting at the centre of the Earth and proceeding beyond the 6371km to the sea’s surface then the result would be a horizontal line with any putative sea level rise entirely imperceptible. PS. “[…] flooding from torrential rainfall like we’ve seen in England?” and Scotland. This is indeed true, and indeed, why would anyone worry about sea level rising by just 0.1% of the Earth’s radius? Sea level rise?!? There’s hardly any water on earth anyway! I don’t understand. How can this have any impact on AVISO altimetry measurements? Would there be a localized impact on tide jauges used for calibration? I don’t know if you’ll remember this, but you participated in some of the sea level threads at Climate Etc. The water chef used to claim that steric sea level rise was flat during the pause, and Paul S would sometimes counter that there was an area in the Western Pacific that is both poorly sampled by ARGO and thought to be in the region with the most steric rise. Since then I’ve been waiting for it to emerge in the numbers. If Zwally is right, then the sea level budget is out of balance again, so it as to be coming from somewhere. The question of which form of impact will prove the most costly begs a time-frame. If AGW is not controlled, then eventually the sheer loss of farm land to drought and desertification would probably outweigh the same loss to sea level rise, but this is measuring cost in terms of population decline. It is also a bit long term for my taste, in that we’d have lost this civilization before 2100 while SLR is still just taking off from its first few metres. “Research released today shows that within the next 10 years large parts of Asia can expect increased risk of more severe droughts, which will impact regional and possibly even global food security. On average, across Asia, droughts lasting longer than three months will be more than twice as severe in terms of their soil moisture deficit compared to the 1990-2005 period. This is cause for concern as China and India have the world’s largest populations and are Asia’s largest food producers. Given the ongoing increase of extreme droughts in most other major food producing regions, this implies that during the 2020s we are liable to see the concurrence of drought-based crop failures in two or more regions, thereby forming the onset of serial global crop failures. The geopolitical destabilization resulting from that onset, certainly including chaotic regime changes and likely including resource wars, would be beyond any catastrophe since WW2, and could of course escalate. OTOH, with massive effort at collective action disdaining the nationalism that has thus far blocked coherent action on AGW, such a catastrophe might be enough to turn our global society around. Personally, I’d rather dump the nationalism now and get on with the requisite collective action, than rely on the dubious hope that loss of food security won’t push nations further into nationalist antipathy. Also, not related, but that Hurricane Alex (85 mhp now) headed for the Azores and points north! Just a note about the dip around 2011. That was due to deluges in Australia, where the water takes a very long time to reach the sea, due to the odd topography, though it didn’t take too long to get back to trend. I guess that could happen again. Also big floods in Pakistan around then. Ah, I was going to ask about that – thanks for explaining. I must admit I really wouldn’t have thought that such regional land-based rain was such a large effect on a global scale. I take it that we are actually fairly sure about this effect? WRT the current spike, wouldn’t it have to be the opposite… a much higher percentage of total precipitation falling on the oceans. We are currently in a big el nino, with a hot atmosphere. Hot air holds more moisture than cool air. When the current el nino finishes, and the atmosphere cools, do we expect large amounts of water to come out of the atmosphere and cause flooding? It does reiterate something that I did already know, though, which is that both ENSO phases bring intense precipitation, just to different places. Given that precipitation patterns are pretty intricate and localized, it might be tough to really tell what the global mean value was, what the trend in it (if any) is–and it’s not clear what the significance of that would be if you did succeed in deriving, compared with localized trends so highly consequential to their own locales. Precipitation comes from water that very recently evaporated. Then how does water that evaporated a while ago get back to earth? Average residence time for a water vapor molecule in the troposphere is something like 10 days. That said, some small fraction of molecules has probably been there for many years simply on a probabilistic basis. It’s called lying with statistics. “It’s called lying with statistics”. What is called that, JDR, and who is calling it that? Up to 27 inches of rain was reported in a five day period. Columbia, SC and Charleston, SC each had their all-time wettest 1-day, 2-day, and 3-day periods on record. In just the first three days, October 2015 became Charleston’s wettest October and one of its all-time wettest months.